The promised transfer of Rs 6,000 every year amounts to an average of Rs 500 per month. The National Bank for Agriculture and Rural Development (Nabard) in its rural financial inclusion survey 2015-16 had estimated farmer’s average monthly income from cultivation at Rs 3,140 in its rural financial inclusion survey 2015-16. Therefore income support of an average of Rs 500 per month comes out to be 16% of a farmer’s average monthly income from cultivation. The scheme is designed as a tribute to the workers in the unorganised sector who contribute around 50 per cent of the country’s Gross Domestic Product (GDP). Deen Dayal Antyodaya Yojana (DAY) aims to uplift the poor folks by enhancing sustainable livelihood opportunities through skill development. Aims to reduce the financial burden on poor and vulnerable groups arising out of catastrophic hospital episodes and ensure their access to quality health services. PM-JAY is a scheme of the government under Ayushman Bharat. 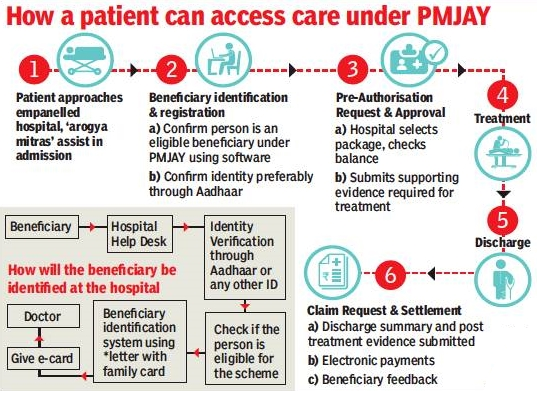 PMJAY is government-sponsored health insurance scheme, that will provide free coverage of up to Rs 5 lakh per family per year in any government or empanelled private hospitals all over India. It will cover beneficiaries families identified on the basis of Socio Economic Caste Survey (SECC) 2011 in 444 districts of 30 states/Union Territories. National Health Agency (NHA) is the apex body for implementing this scheme. States will be required to form State Health Agency (SHA) to implement scheme and at the district level also structure for its implementation will be set up. Around 13000 hospitals both public and private in the country have been coordinated for implementation of the scheme. PMJAY will be funded with 60% contribution from Centre and remaining from the states. NITI Aayog will be working as partner for this scheme for operationalizing robust, modular and interoperable IT platform which will involve a paperless and cashless transaction. PMJAY is entitlement based scheme with entitlement decided on basis of deprivation criteria in the SECC database. There will be no cap on family size and age under this scheme. The benefit cover under it also includes pre and post-hospitalisation expenses. It also takes into consideration all pre-existing medical conditions. It will provide reimbursement for bed charges and drugs and diagnostics two days before, during and 15 days after hospitalisation. Beneficiary will be also paid transport allowance for hospitalisation defined under it. The payment for treatment will be done on package rate which will be defined by Government in advance basis. The package rates will include all costs associated with treatment. States and UTs have flexibility to modify these rates within limited bandwidth. PMJAY allows national portability i.e. resident of any part of country is entitled for free hospitalization at empanelled hospital anywhere in the country. It will strengthen healthcare services in India by targeting poor and vulnerable population of the country. The scheme allows beneficiary to take cashless benefits from any public or private empanelled hospitals across the country. ID documentation required for verifying beneficiary under this scheme may be Aadhaar card or election ID card or ration card. Beneficiaries will QR codes having letters for verification through scanning. Scheme also seeks to accelerate India’s progress towards the achievement of Universal Health Coverage (UHC) and Sustainable Development Goal – 3 (SDG3). “National Health Agency” has been dissolved and it is now restructured as an Authority to effectively the implement Pradhan Mantri – Jan Arogya Yojana (PM-JAY). Why the Authority has been constituted? Replacing the multi-layered structure with a simplified structure. 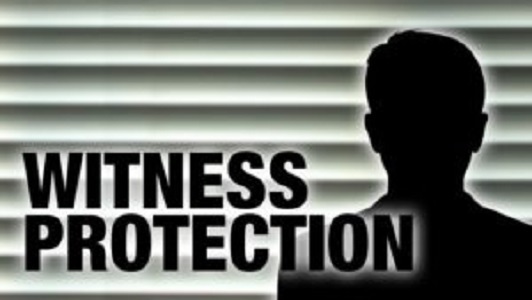 Authority will be able to specify treatment protocols and enforce their compliance. The Authority with a stronger mandate would be able to prevent, detect and control frauds, abuse and redress grievances, thus resulting in the reduction of leakages. Ministry : Ministry of Women and Child Development in collaboration with the Ministry of Home Affairs. It is easily accessible, low cost, tax-efficient, flexible and portable retirement savings account. It was launched in 2004 and was initially introduced for new Government recruits (except armed forces). It aims to institute pension reforms in country and to inculcate habit of saving for retirement amongst the citizens. Its objective is to provide retirement income to all the citizens. Under it, individual contributes to his retirement account. Employer can also co-contribute for social security/welfare of individual. It was extended for all citizens of country from May 2009 including the unorganised sector workers on voluntary basis. NPS is governed and administered by Pension Fund Regulatory and Development Authority (PFRDA). Currently, any Indian between age of 18 to 65 years may voluntarily join the NPS. NRI can open an NPS account, however contributions made by NRI are subject to regulatory requirements as prescribed by RBI and FEMA from time to time. Objective is to uplift urban poor folks by enhancing sustainable livelihood opportunities through skill development. It is Centrally Sponsored Scheme. Its intended beneficiaries are urban poor (street vendors, slum dwellers, homeless, rag pickers); unemployed and differently abled. It provides for employment through Skill Training and Placement through City Livelihood Centres to reduce poverty and vulnerability of the urban poor households. It also provides social mobilization and institution development through formation of Self-Help Groups (SHG) for training members and hand holding, an initial support of 10, 000 is given for each group. It also provides subsidy to urban poor i.e. interest subsidy of 5% – 7% for setting up individual micro-enterprises with loan of up to 2 lakhs and for group enterprises with loan limit of up to Rs.10 lakhs. It fully funds cost of construction of shelters for urban homeless. It also provides for development of vendor markets and also promotion of skills for vendors through setting up infrastructure and special projects for rag picker and differently abled etc. Aim: The scheme aims at improving skill of weather and climate forecast through sustained observations, intensive Research & Development. It consists of nine sub-programmes which are multi-disciplinary and multi institutional in nature and will be implemented in integrated manner. It seeks to addresses different aspects of weather and climate services, which includes warnings for cyclone, storm surges, heat waves, thunderstorms etc. Each of these aspects is incorporated as nine sub-schemes under umbrella scheme ACROSS and is implemented in integrated manners. It will provide improved weather, climate and ocean forecast and services, thereby ensuring transfer of commensurate benefits to the various services. It will generate employment opportunities to many people as large number of agencies like the Krishi Vigyana Kendras of ICAR, Universities and local municipalities are roped to ensure last-mile connectivity of the weather based services to the end–user. The fund is created by Ministry of Finance in 2013 with a corpus of Rs 1000 crore. It is aimed at enhancing the safety and security for women in the country. It is being monitored by Empowered Committee of Officers under Secretary of Women and Child Development Ministry. It is an inter-ministerial committee which appraises and recommends various projects (schemes) proposed by different ministries to be funded from Nirbhaya Fund.